Ooooh these are ever so lovely! Perhaps arthur and I can use these to make new friends? Why is it that we often have weird neighbors I have no interest in bringing handmade cute little things to? What a pretty package for a neighborly batch of cookies. I am feeling inspired to get the ingredients and make some love for my neighbors. What a nice design! Too bad I have weird neighbors too!! I looked at her other work and it is just as cute. These have to be the prettiest thing i have ever seen! Soooo adorable! I can't wait to make this! Yay for a new blog subsciption! 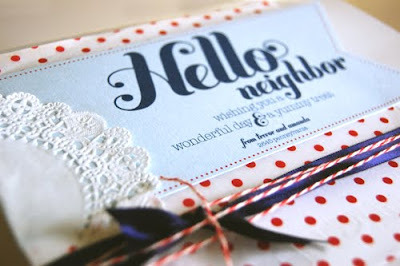 A welcome gift decorated with this packaging is sure to make a new friend! My word verification is "mulkman". Close! Ha! How friendly! I always want to give something to my new neighbors, this little kit is too precious. LOL. I am a paper plate and foil gift-giver, too. Thanks for this! omg. too cute. love this kind of stuff!! it that's 'something special' to the next level. and I totally agreat with MotherMotherOcean. tooo funny! Ok, where do you live? I would like to be your neighbor! And I'm looking for a new place, too. This is fabulous!! With a little tweaking it would be great for certain school functions, etc, too.